A major problem facing law enforcement agencies especially in the Caribbean and Central American countries is the illegal importation of firearms and ammunition. The importation of illegal firearms poses a great risk to Caribbean and Central American countries. These countries have seen a dramatic increase in gun related crimes in the past few years. Our canines are being utilized at airports, ferry terminals, cargo shipping ports and cruise ships, as well as assisting local police departments in home searches and traffic stops to detect the presence of firearms and ammunition. 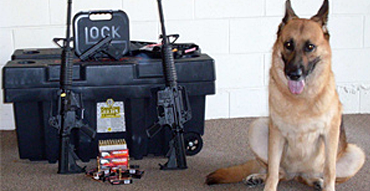 In addition to the outright sale of these detector dogs, K-9 SEARCH AND DETECTION, LLC now offers a unique package of leasing a Handler and Firearm/Ammunition Detector Dog Team to law enforcement agencies.